PhotoRecovery® for Mac was designed to recover deleted, formatted, lost and corrupted photo files from all types of digital media. It is compatible with Memory Sticks, SmartMedia, CompactFlash I & II, Micro Drives, SD/XD Cards, Multimedia Chips, Floppy Disks and most other forms of Digital Film. Simply insert your Digital Film into the reader, and run PHOTORECOVERY® on the media, and then save the pictures off to another location. There was no easier way to salvage those once in a lifetime moments you thought were lost forever! It will allow you to preview the recoverable pictures before purchase. Note: To preserve the data on the drive with the lost picture files, DO NOT download the software to the drive of your camera memory card that you want to recover. You will be able to download the full version of the software product immediately after ordering, and recover your lost photos. 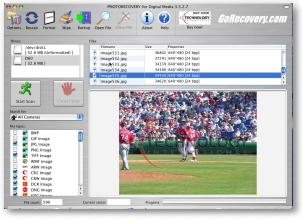 If you are not sure whether the software will recover your lost pictures in your case, it is highly recommended to download and try PhotoRecovery for Mac demo version first. The sales are final and no returns.